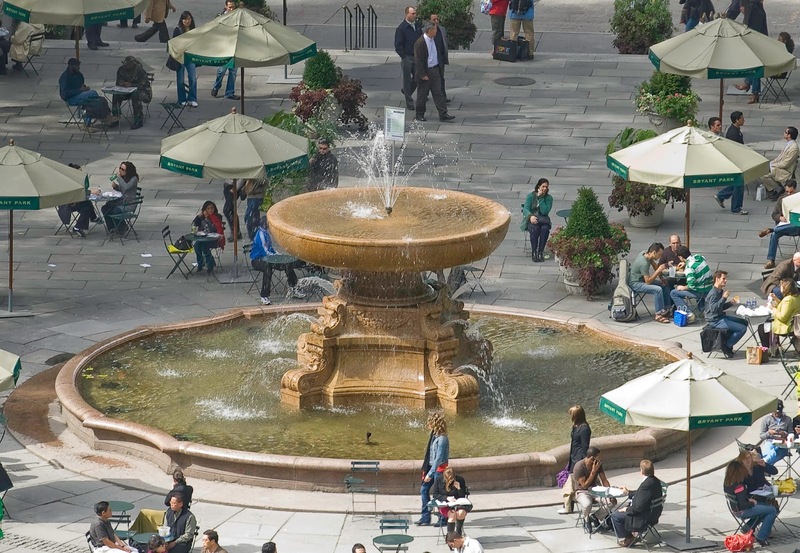 Charge your phone with eco-conscious style in Bryant Park. 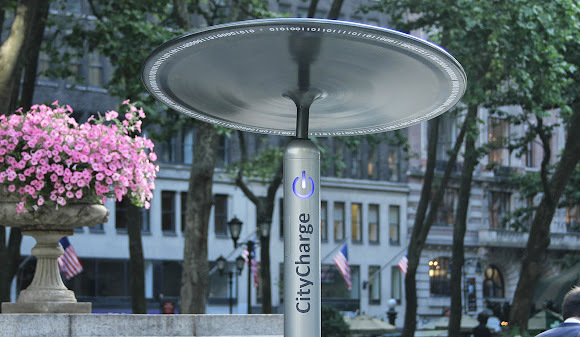 Since 2014, Bryant Park has been the testing ground for the stylish and useful CityCharge solar chargers. They turn the park's abundant sunlight into useful energy, adding to the existing array of 42 public outlets and making Bryant Park even more tech-friendly. They are portable and durable, and during the summer can be found on the Upper Terrace, where you can charge up your phone while they soak up the sun. Our planet-friendly fountain recycles its spray. Once it fills with water, our fountain operates by recycling that water over and over again, rather than continuing to draw from the public supply. It has a filtration system that keeps the water free of algae or debris. The water is refreshed periodically so we can clean the fountain's stone and remove all the coins that accumulate. Another way the fountain is sustainable is that about $4,000 in coins is removed from the basin each year; that is approximately the annual maintenance cost of the fountain! We've talked previously about how our ping pong furniture, from Loll, is made from recycled skateboard ramps. But did you know that the ground surface of the ping pong area is also recycled? Flexi-Pave, the material that covers the ground below the Tables, is made partially from used rubber tires. It provides a soft playing surface to keep ping pong players comfortable during long matches. The Flexi-Pave ground surface, during its installation in 2014. COFFEED, which is wrapping up its first year in our 40th Street kiosk, is doing more than its fair share to help the environment. In addition to sourcing its coffee beans from sustainable growers, the company grows much of the produce it uses in its delectable baked goods, salads and sandwiches. They even keep beehives and produce their own honey! Bryant Park staff visited their urban rooftop farm in Long Island City this past summer, and you can read our blog post about it here. Urban green spaces are an essential part of sustainable cities, and we take that role seriously by doing our part to help the planet. Have a happy Earth Day! How Earth friendly are the substances used on the lawn we all touch with our skin and let our infants and toddlers frolic on?